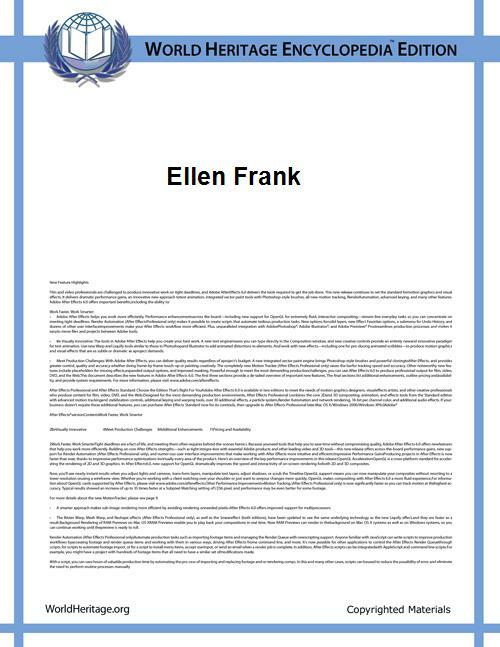 Ellen Frank is an artist, writer, and educator, currently based in New York. 2 Ellen Frank Illumination Arts Foundation, Inc.
She was born in Los Angeles. She received her Bachelor of Arts degree from the University of California, Los Angeles; her Master of Arts and Ph.D in literature and visual arts from Stanford and Yale universities, prospectively. Also, she was Assistant Professor of English at the University of California, Berkeley from 1973-1977. Frank has published several written works, among them Literary Architecture: Essays Toward a Tradition (University of California Press) and other various essays on the topics of painting, architecture, and literature. Literary Architecture: Essays Toward a Tradition (University of California Press) has won several awards, including the "Best of All Award Winning Books" by Book Builders West, The Ronce & Coffin Club Design Award, and the New York Institute for Graphic Arts 50 Best Books. She co-wrote a play titled Frida@chiapas.net with Maria Pessino who is the founder and director of Oddfellows Productions. The Theatre for the New in New York City hosted the play for its first reading, and Robert Wilson's Watermill Center hosted the second reading in July 1999. Frank has received various awards and recognition for her work in both painting and writing. She was accepted as a Fulbright Fellow to further her studies in Aesthetic Theory under Sir Ernst Gombrich. Frank also received the Ford Foundation Grant in Lithography, a Pollock-Krasner Award in Painting, and a New York Foundation of the Arts Award in 1997 for her illuminated manuscript. Frank's art has been exhibited throughout the United States, including the Soho Guggenheim to inaugurate "T", where she showed a sequence of 18 paintings. Also, in 1999 J/Brice of Boston, MA commissioned Frank to create an 84-foot mural in copper, gold, and silver leaf on linen. In 2001, Frank was invited to be Professor and Guest Artist at Barnard College and at Rutgers University. In 2004, Ellen Frank founded the not-for-profit organization, Ellen Frank Illumination Arts Foundation, Inc., where she remains as the artistic director. The organization focuses on the art of illumination and the creation of new works of art in this genre. The art form of illumination is centuries old and incorporates pictures, paint, and precious metals to adorn sacred documents of particular civilizations. These sacred documents include Hebrew marriage contracts, New Testament manuscripts, and a Koran, and are kept in archives and museums to protect the ancient art form. The goal of the Ellen Frank Illumination Arts Foundation is to revitalize the art form of Illumination, while promoting peace education and bridging religious gaps. In 2005, the organization created the Illumination Arts Atelier, a workshop that is modeled after the traditional Renaissance ateliers. Accepting interns from South Korea, the United States, Columbia, Japan, and Poland, the atelier teaches the students about manuscript illumination and illuminated painting using 22 karat gold leaf, silver leaf, copper leaf, linen, vellum, paper, papyrus, and egg tempura. Cities of Peace was the first work created at the Illumination Arts Atelier and consists of nine, 6x8 foot paintings that are illuminated with gold. Each of the nine paintings represents a different city that has been traumatized by war and honors the particular city's history and culture. The cities include Beijing, Hiroshima, Kabul, Baghdad, and New York City. Cities of Peace premiered in the Laurie M. Tisch Gallery in New York City in 2005. In 2009, it was exhibited in the Cathedral of St. John the Divine in New York City. Ford Foundation Grant, Tamarind Lithography Workshop, 1968. Leverhulme Trust Fund Fellow, 1971-1972. Fellow, Courtauld and Warburg Institutes, 1973. National Endowment Matching Grant (Pequod) 1982, 1981, 1980, 1979. C.C.L.M] Award (Pequod: A Journal of Contemporary Literature, 1982, 1981, 1980, 1979. Bookbuilders' West, "Best of Show," 1980. Rounce Coffin Distinguished Books Award, 1980. American Institute of Graphic Arts, "50 Best Books," 1981. "Highest Excellence in 50 Years," University of California Press, 1986. Pollock-Krasner Foundation Award in Painting, 1986. Al Young Distinguished Artist, Knox College, Galesburg, IL, 1989. New York Foundation for the Arts Award for Hanukkah Illuminated: A Book of Days, 1996. Jump Start the Arts Ninbark International, NYSCA & Consortium of Arts Councils, 1999. Individual Artist Award for Illumination Atelier Project, New York State Council for the Arts, 2000. New York State Council for the Arts, Ninbark International, 2000, 2001.